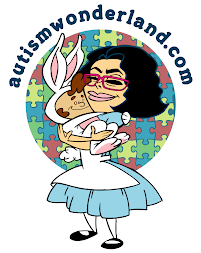 AutismWonderland: Blogs By Latinas - AutismWonderland Has Been Nominated! Blogs By Latinas - AutismWonderland Has Been Nominated! When The Boy was first diagnosed, I searched every bookstore for books on autism. I have a two bookshelves in my own home (tiny apartment) dedicated to autism. Not a single one was written by a Latina. When it comes to autism in the mainstream media, Latinos are rarely featured. It's not to say we don't exist or that our numbers are minuscule in comparison to other ethnic groups. It's just not something we talk about. And if we don't talk about it openly, how can we expect to make an impact? It's the reason I started this blog. It's the reason why I'm so proud of my nomination. Autism doesn't discriminate. And our stories need to be heard. Voters must select a blog from each category to complete voting process. Help me continue sharing our story.